UK company Path Intelligence has proved that the longer people spend in shops, the more they spend. Not a shock result perhaps but the technology behind it has a range of other uses. The company's system reads an anonymous identifier that mobile phones transmit and can then track their movements. The approach will be useful for research, security and improving services in environments ranging from train stations to refugee camps. 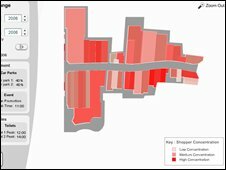 For their first commercial project, the company has studied the movements of shoppers in a UK shopping centre to determine the paths that shoppers take and how long they spend in the centre as a whole. They found that for an increase of 1% of time spent, shoppers spend 1.3% more on purchases. "The real problem is that it's been hard to quantitatively analyse this," says Toby Oliver, the company's chief executive. "People say, 'you know, I think this is the case' but what we're able to do now is put some numbers behind those behavioural effects." What that means for retailers is that dwindling numbers might be offset by simply keeping shoppers' attention longer. Mobiles are assigned a temporary anonymous number by the network called a temporary mobile subscriber identity, or TMSI, which the phone periodically transmits to advise of its location. As the phone moves through the different regions served by different base stations, that number changes. Path Intelligence's approach, called FootPath, directly detects that TMSI transmission from phones. No access to the mobile networks themselves is necessary, so the information that they glean is specific to a user, but completely anonymous. The TMSIs can only be associated with a number by the mobile operators and Path Intelligence encrypt the TMSIs that they acquire as an added level of security. Sharon Biggar, chief operating officer of Path Intelligence, likens the approach to the way that online browsing is tracked: users are associated with a dynamic IP address which can be tracked as they visit online stores. "Those websites will be following and understanding how you're using their site, which pages you're going to, how long you're spending on each page," she says. "Our situation is almost completely analogous to that." A number of research projects have used mobile networks' data to track mobile users within about 50 metres in a process that has been dubbed "reality mining", and there are even commercial services that will do the tracking. By contrast, depending on how many of their detectors they place in a given space, FootPath's tracking can be done to a precision of about a metre or two. The company is presently involved in several market research projects. It has been approached by humanitarian workers in refugee camps, where a lack of central planning means it is often difficult to site services such as clinics where they can be best used. The system will also be useful for researching the layout of, for example, train stations. Contraband mobiles operated from prisons are frequently used for crime organised from the inside, and jamming the signal within prisons presents problems for mobile users nearby. The FootPath system could simply pinpoint the mobile's location.